CDs are available for purchase from Waterbug Records. Melody’s Music carries a wide selection of Therese’s music collections and related items. Online, you can find them on the Therese Honey page at Melody’s Music. Honey’s Celtic Harp Book, Volumes I, II and III by Therese Honey and Larry Mallette. Twenty Irish and Scottish airs, jigs, reels and hornpipes arranged for beginner-intermediate Celtic harp. For solo Celtic harp, but can be used for harp ensemble or with C melody instrument, with background notes on the tunes. 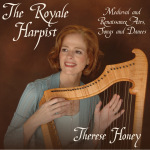 The Royale Harpist by Therese Honey. Twenty-two medieval and Renaissance airs, songs, and dances from Spain, France, England, and Scotland, arranged for beginner-intermediate Celtic harp. Includes historical notes and bibliography. So Merry as We Have Been by Therese Honey. Ten 18th-century Scottish songs (from Robert Macintosh Collection, 1745-1807, and Adam Craig Collection, 1730) edited for all harps. Scotland the Brave by Therese Honey. Eight Scottish tunes arranged for Celtic harp. Farewell Tae Tarwathie, Skye Boat Song, Rowing from Isla to Uist, Miss Elder, Scotland the Brave, Jack O’Tar, Miss Lucy Campbell, Blew Breiks. English Country Dances by Ellen Tepper, Therese Honey, and Darhon Rees-Rorhrbacher. Twenty-one tunes from the Playford collection of 1651, arranged for lever harp. Published by Dragonflower Music. Two Sephardic Songs by Therese Honey. For harp ensemble, four parts, but can be played by three harps. La rosa enflorece, A la una you naci. Left Hand Toolbox by Therese Honey. A collection of accompaniment patterns and an introduction to chords.